Start your RV adventures with a super deal on your dream RV from National RV Detroit! With our great prices and excellent customer service, we're regarded as one of the top RV dealers in Michigan - and the nation! Our lot at 44700 N I 94 Service Dr Belleville Michigan 48111 is full of top quality, famous brand RV models, including this New 2019 Palomino Columbus 329DV! For more information about this 5th Wheel or any other of our top brand models, call us at 734-439-3400 and talk to one of our friendly, knowledgeable RV experts! Save $1000s on your dream RV! It's easy to hit the road with this RV! It has a rugged GVWR of 14962 lbs! It hooks up fast, and the hitch weight of 2035 lbs. makes it easy to tow! The 17' 0" power patio awning means you'll enjoy outdoor comfort and protection from the moment you arrive! 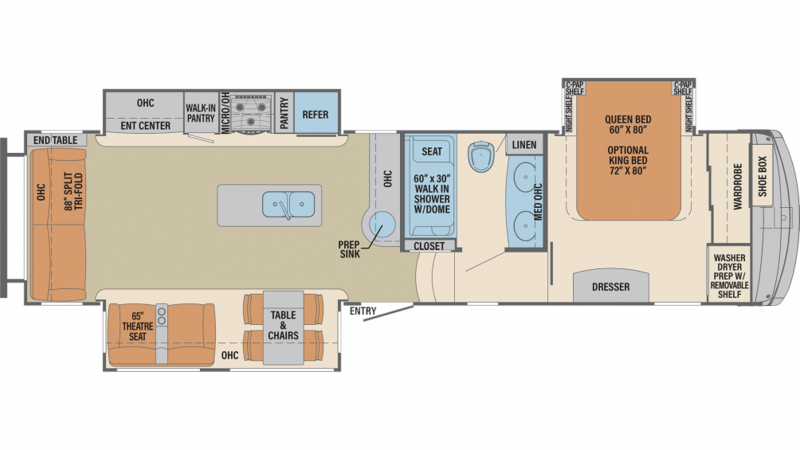 There's lots of room for the whole family in the spacious living area of the Columbus 329DV, thanks to the 3 slides that maximize the space inside this 38' 1" long, 8' 5" wide, and 12' 4" high 5th Wheel! And you'll enjoy the perfect climate inside, no matter how cold or hot it is outside, thanks to the modern 15000 BTU a/c unit and the efficient 35000 BTU furnace! Nothing beats a restful night's sleep when you're on the road, and the Palomino Columbus 329DV provides your family with great sleeping accommodations for up to 4 people, including a terrific bedroom! The Queen bed is roomy and comfy and you'll drift off to sleep in no time! Enjoy something different from the campfire food and restaurant chain offerings with the kitchen in this 5th Wheel! Cook up tasty meals on the 3 burner range cooktop, and store fresh food in the 8.00 cu. ft. refrigerator! The sink offers plenty of clean water from the 75 gallon fresh water tank! The campground bath facility is often cold, damp, and uncomfortable. It also tends to be packed with other people, and far away from your spot on the campground. But, you can avoid it altogether with this RV! It comes with a full bathroom, complete with a sanitary Porcelain Foot Flush toilet and a roomy shower! Plus with 60 lbs. of LP tank capacity, you can make your showers be as hot as you need them to be! Your used water and waste are discreetly stored in the 71 gallon gray water tank and 39 gallon black water tank, so you don't have to deal with it while you're having camping fun!